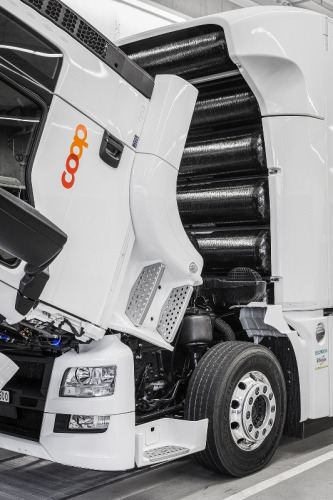 Coop Mineralöl is now operating what it says is the world’s first fuel cell powered heavy truck and trailer, with hydrogen stored in seven carbon fibre cylinders behind the driver’s cab. Coop Mineralöl's fuel cell powered heavy truck powered by a PowerCell S3 PEM fuel cell stack integrated by Swiss Hydrogen. 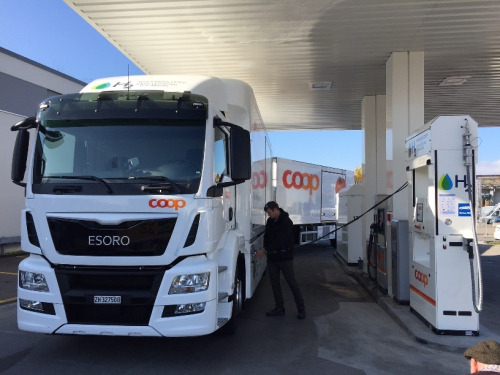 The fuel cell powered heavy truck and trailer is being refueled at Coop’s new hydrogen station in Hunzenschwil, alongside conventional fuels. The ‘green’ hydrogen is produced using electricity from IBAarau’s hydroelectric power plant. 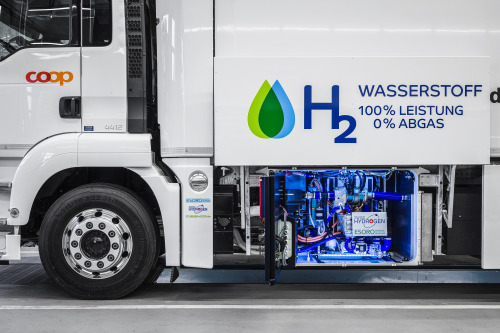 A Swiss consortium has demonstrated a fuel cell powered heavy truck and trailer, and also inaugurated Switzerland’s first public hydrogen refueling station, which uses hydroelectric energy to power an electrolyser for generating the hydrogen. The new truck has been developed by a consortium including the Swiss automotive contractor ESORO. This is believed to be the world’s first fuel cell powered truck in the 34 tonne category, with the necessary load capacity to be fully integrated into the regular logistics management of filling station operator Coop Mineralöl. Several truck manufacturers are looking at the possible use of hydrogen. Major European retailers such as ASKO in Norway and Colruyt in Belgium – and other transport companies and operators of municipal vehicles – are expressing growing interest in hydrogen technology. The manufacturing costs of a fuel cell truck are still considerably higher than those of a conventional diesel truck. However, total-cost-of-ownership (TCO) analysis shows comparable figures for both options in Switzerland. Fuel cell trucks are exempt from mineral oil tax and are not subject to road charges, and have lower maintenance costs. In its distribution logistics for its retail outlets, Coop mainly uses 18 tonne diesel trucks with trailers (total weight of 34 tonnes). However, hydrogen-powered trucks offer the same performance as conventional diesel vehicles, but with zero emissions. A hydrogen-based energy supply also enables efficient operation of the auxiliary units on the truck, such as chiller units. The clean electricity powers the electric drivetrain via the high-performance electric motor and a modified automatic gearbox. Surplus energy is fed to a lithium-ion battery for storage. Energy recovery converts braking energy into electricity, which is also stored in the battery. At full acceleration the battery boosts the power and ensures good driving dynamics. The hydrogen is stored behind the driver’s cab, in a rack holding seven carbon fibre cylinders rated at 350 bar, situated directly on the refrigerated body. These tanks provide the truck with up to 31 kg of usable hydrogen, for a range of 375–400 km (235–250 miles).The high-pressure hydrogen storage units are subject to strict regulations, and are specified and certified for mobility use. The hydrogen storage unit is filled via the tank nozzle on the driver’s side in just a few minutes, as with diesel fueling. The PEM fuel cell power plant for the truck has been developed by Swiss Hydrogen, and features a prototype S3 fuel cell stack supplied by its partner PowerCell Sweden. The PowerCell S3 stack is compact and designed for easy installation in a vehicle, as well as meeting the strict requirements of the automotive industry. The S3 stack operates on hydrogen with high efficiency (approximately 52%), which gives a competitive advantage compared to other fuels. The stack for the truck is rated at 100 kW output power, which corresponds to 134 bhp. The scalable design of the system means that stacks can be connected in series, for higher power outputs. PowerCell signed a collaborative agreement with Swiss Hydrogen in April 2016. Swiss Hydrogen has broad experience in the design, assembly and integration of fuel cell systems in various applications, and has also cooperated with sales and marketing activities worldwide. 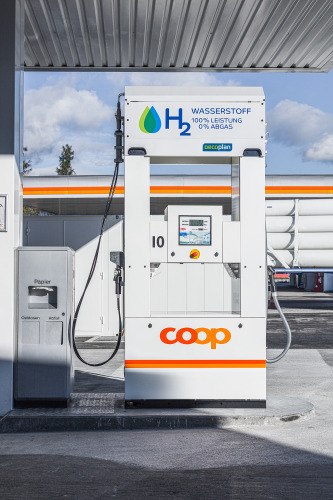 Meanwhile, Coop Mineralöl has just opened Switzerland’s first public hydrogen refueling station, at its existing filling station in Hunzenschwil, in the northern canton of Aargau. The station will serve Coop’s new hydrogen-powered truck and trailer, and also 12 Hyundai ix35 Fuel Cell cars that are being used by employees at the nearby Schafisheim distribution centre. The truck will be based in Schafisheim to make deliveries to sales outlets across the northwest/central Switzerland/Zürich region. Hydrogen is transported and stored at high pressure. At the production stage the output pressure is 30 bar, it is then compressed to 200 bar for transport. The hydrogen trailer must be able to unload the hydrogen as quickly as possible, so the hydrogen is transferred to the large 50 bar tank at the station, where it is compressed to 950 bar in high-pressure tanks. Compressing the hydrogen to 950 bar presents the biggest technical challenge at the station. Compressor failure is the most common cause of operational failures at existing hydrogen stations around the world, so Coop Mineralöl is using the highly reliable IC90 ionic compressor from Linde. Fuel cell cars are fueled at 700 bar, while hydrogen trucks and buses are usually fueled at 350 bar; the Coop station in Hunzenschwil offers both pressures. The storage bottles for 700 bar fueling are housed in the same container as the compressor, while those for 350 bar fueling are in a separate container. Both fueling systems are integrated into the dispenser, allowing trucks and cars to be refueled at the same time. Coop wants to ensure that its customers can buy hydrogen at a price per km comparable to fossil fuels; the Coop hydrogen bears its Oecoplan own-label sustainability brand. Further hydrogen stations are already being planned elsewhere in Switzerland. Aargau took part in the just-concluded Clean Hydrogen in European Cities (CHIC) project, with five fuel cell buses and a hydrogen station. And the Swiss Federal Laboratories for Materials Science and Technology (Empa) recently inaugurated Switzerland’s first hydrogen station that can dispense at 700 bar for passenger cars, on its campus in Dübendorf, as part of the ‘move’ mobility demonstrator project. The ‘green’ hydrogen for these vehicles is being produced at the nearby run-of-the-river hydroelectric power plant of local energy supplier IBAarau, in partnership with H2 Energy AG, and then delivered to Coop Mineralöl. The electrolysis at the plant in Aarau takes place whenever grid demand for electricity is low. The topography and high average rainfall in Switzerland offer ideal conditions for using water-based energy. The planned hydrogen production plant will enable around 2% of electricity produced at the hydroelectric power station to be converted to hydrogen. The annual hydrogen production time will be some 7500 hours. For the 200 kW hydroelectric plant, this gives an expected annual output of around 20 000 kg of hydrogen, sufficient to run about 170 cars, or three or four large trucks. US-based Proton OnSite has supplied a C30 hydrogen generator utilising a PEM electrolysis cell stack and pressure swing adsorption (PSA) technology for this application, which has been integrated by Diamond Lite SA. The hydrogen storage trailer is from Messer Schweiz, and comprises 10 steel tanks storing 338 kg of hydrogen at 200 bar. The degree of purity of the hydrogen produced meets the SAE J2719 standard, and satisfies the requirements for fuel cell electric vehicles (FCEVs). As well as enabling larger quantities of (fluctuating, renewable) energy to be stored, which is vital to the new national energy policy, energy stored as hydrogen can also be made available for other applications and markets. Thus, at times of low electricity prices or surplus energy, the energy can be converted into hydrogen and shipped to other areas. This article was originally published in Fuel Cells Bulletin, December 2016.